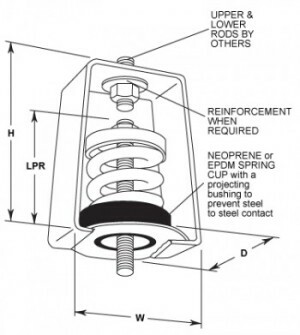 High Deflection Spring Hangers provide far greater vibration control than the lower deflection neoprene hangers. 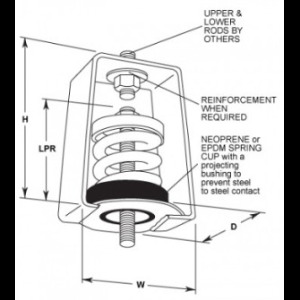 Each powder coated steel spring is in series with a neoprene cup, providing excellent isolation efficiency. The spring serves to isolate a broad range of disturbing vibration frequencies, while the rubber cup is a high frequency or noise break. All box type spring hangers are available pre compressed from the factory with a scale for adjusting spring tension. They are similar to SLR restrained mounts in that they can be adjusted to limit vertical movement caused by weight changes during system start up, maintenance and seismic events. Spring Hangers are also available with eyebolts top and bottom.